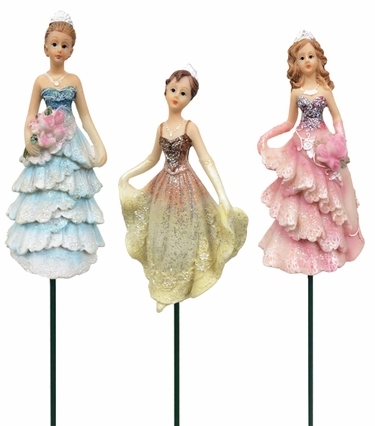 Adorable princess garden stakes, full to extra detail including necklaces, tiaras, flowers and ruffled dresses with glitter that sparkles in the sun. Turn your garden paradise into a magical wonderland of fanciful fun. The set will include 1 Dozen assorted Princess garden stakes. Multiple styles of dresses in pink, purple, blue, yellow, and in various poses. Some may be duplicates. Each holding her dress or a bouquet of flowers, you can cherish them all! Size: 4" Princess, approx 15" tall.